Every year on 26th of July Parent’s Day is celebrated throughout the world to honor every single parent on behalf of their efforts to make their kids a better person. Parents are our roots who have nurtured us with everything as well as cherished our dreams by sacrificing their own. Let’s face the fact, parents are the most important people in our lives. They act as a torch and light the path for us towards a better and secured future. 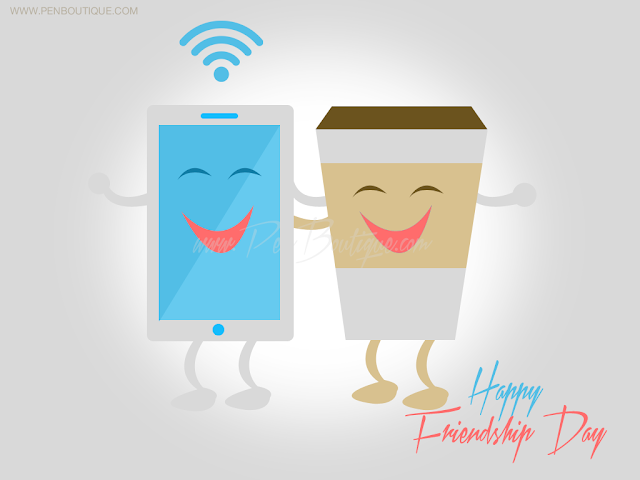 Thus, Parents Day is part of the year when we get a chance to compliment our parents for all their sacrifice and moreover this is the day when we express our gratitude towards them. How often do we gift a special gift to our parents? Probably twice a year but a fact that we should acknowledge is that a small effort from us can bring an immense amount of joy to them. So, on this year’s Parent’s Day present them something special I assure you it will bring out the lost smile on their faces that you’ve been longing to see for a long time. I know that no special gift can portray the picture of your parents that you pasted in your heart. But some gifts can actually convey the message that you’ve treasured in yourself. 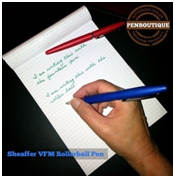 Here are some gift ideas from Pen Boutique. The elegant look of this pen speaks it all. This pen comprises of a sophisticated design printed over an ivory lacquer base and a hefty body that ensures a smooth writing experience. Overall this pen would be a perfect gift to amuse your parents. This is an ideal gift for every occasion. Monk Paper Charcoal Lokta Quotation Journal comprises of a beautiful cover which homes 48 pages of Lokta paper. Believe me your parents will love it. Hampton-Haddon Mini Gimbel Clock a perfect gift that will fit in your budget. This clock will be an ideal desk accessory and always remind your parents of you whenever they roll their eye on it. Are you looking for an ideal gift which will act as a token of love and express your gratitude towards your Parents? Then the Kalifano 4" Marine Blue World in Silver Hand will be a thoughtful and moreover a meaningful gift. This product features a striking look flaunting a sturdy design and vivid artistry which can convey the message that how they acted as a helping hand to build your world. When I heard that Napkin® had a pencil-like writing instrument that never needed to be sharpened, the first thing that popped into my head was “Napkin makes pens?” The second thing that popped into my head was “That sounds like the Jac Zagoory Beta Pen… Napkin makes pens?” The ubiquitous name “Napkin” conjures associations the same way “Kleenex” does – or, in this case, the way “Pininfarina” associates with luxury car design. 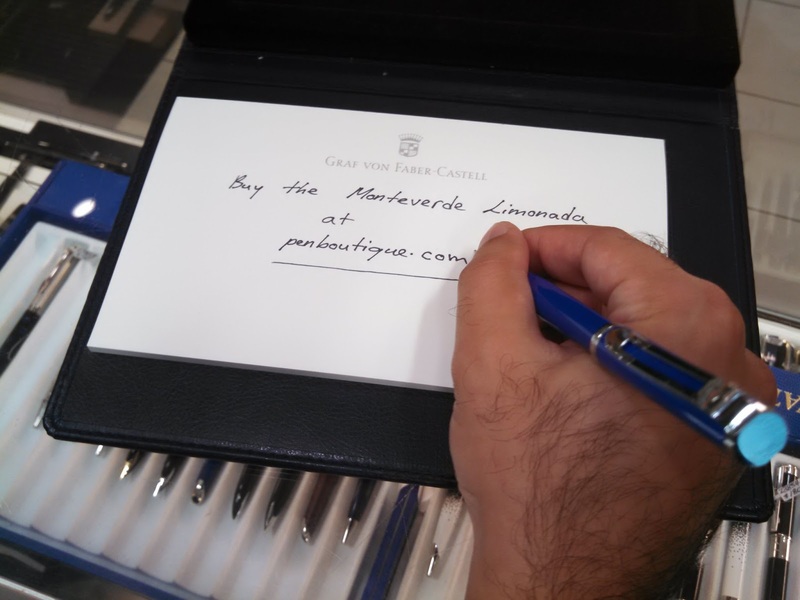 Bring together designers from these two Italian companies to create a never-ending writing instrument, and the Napkin Forever Pininfarina Cambiano Desk Set emerges. 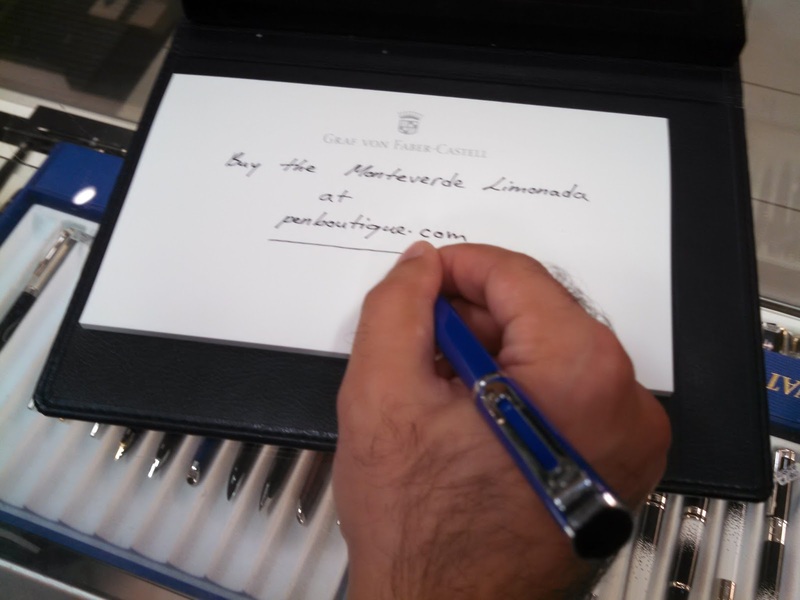 At first glance, you can see the Pininfarina influence in the sweeping design of the metal on the body of the instrument – I hesitate to call it a pencil or a pen, as neither description truly fits. Napkin has incorporated the same writing tip as it has on its other Forever pieces - Ethergraf®. 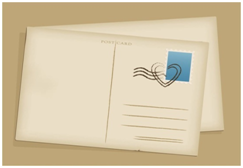 Ethergraf® is a special metal alloy that creates a mark on paper via oxidation. The line looks like a pencil mark, but because it is interacting with the paper rather than leaving material on the surface like a pencil does, it isn’t erasable. I did notice that the darkness of the line varied depending on the type of paper, so that is something to consider if you prefer darker lines. The rest of the body is made of aluminum and walnut, with the metal portion available in either a Matte Black (more of a grey on my example) or Copper color. The piece feels a little rear heavy, though when actually writing the weight distribution doesn’t hinder the user. What I really like is the pen holder/desk stand/protective case. Made of walnut, like the body of the pen, it allows you to either have the pen standing at an angle, laying flat across the top, or protected inside (this is how the pen arrives). This box is actually functional and won't be just taking up space in a drawer or closet, a nice variation from the norm. As for the actual writing experience – this is an interesting piece. On some types of paper, I noticed an almost “stickiness” when lifting it off of the page. This only occurred after I had written something and was very deliberate in lifting the instrument off the page, but did not appear if I touched it to paper or wrote as I normally would. Perhaps this is a side effect of the alloy’s interaction with the paper? The weight felt good in the hand despite its relative unevenness, and the shape was very ergonomic. The instrument was relatively smooth across the page, though not as smooth as an HB pencil I happened to have on my desk. This set is a statement - automotive design meshing with innovative creativity - rather than something to replace your favorite pen or pencil. Standing in its holder, the pen has a somewhat retro look due to the materials used, and the Pininfarina influenced lines make it look like it’s going 100 MPH. The desk stand is a fantastic touch and something I think, other than never needing to purchase another pencil or sharpener (or eraser), really adds to the value. 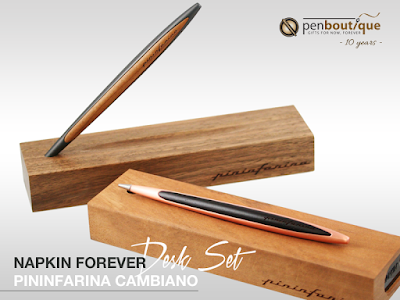 If you're looking for a stylish writing instrument which melds Italian automobile flair with modern metallurgy, the Napkin Forever Pininfarina Cambiano Desk Set is a fine choice. 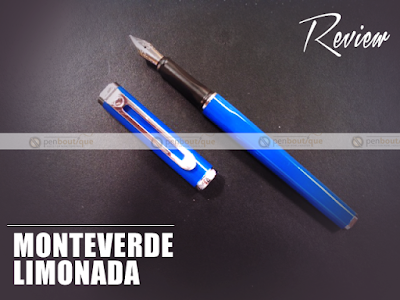 For that fun and stylish summer pen, Monteverde Limonada is a great choice that offers style, practically, and durability. 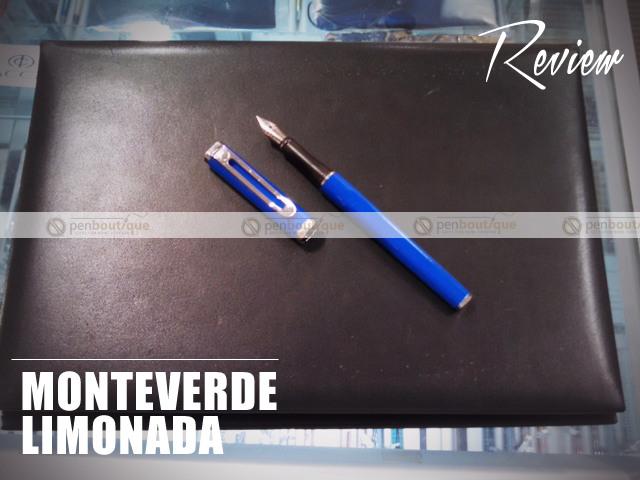 The Limonada is one of the latest creations from by Monteverde and has an affordable price for one starting with fountain pens or looking for an everyday writer to carry on the go. A flair of fun style, the pen comes in the following colors: Milano Black, Tivoli Yellow, Roma Gold, Torino Red, and Capri Blue. The Capri Blue has a good luster with shiny steel ascents that contrast well. The body and style are reminiscent of that fun Italian sports car one would love to ride. The contoured body offers a comfortable grip, which is thinner than the rest of the body. The body itself has a light weight and almost medium weight when posted. Don't let that fool you- the all brass body is durable and gives substance to the light pen.The cut-out stylish steel clip is firm and snug. Writing with the pen is a pleasant surprise. 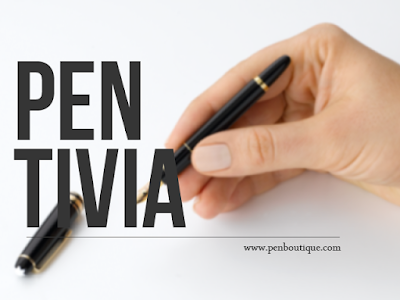 The medium iridium steel nib is standard, yet is sufficient.When writing it is especially smooth on down strokes. Though a slightly firm steel nib, there is not as much feedback as one would expect. An added convenience is that a converter is also included and that the pen takes Standard International cartridges. While it's still summer be sure to grab the refreshing Monteverde Limonada. 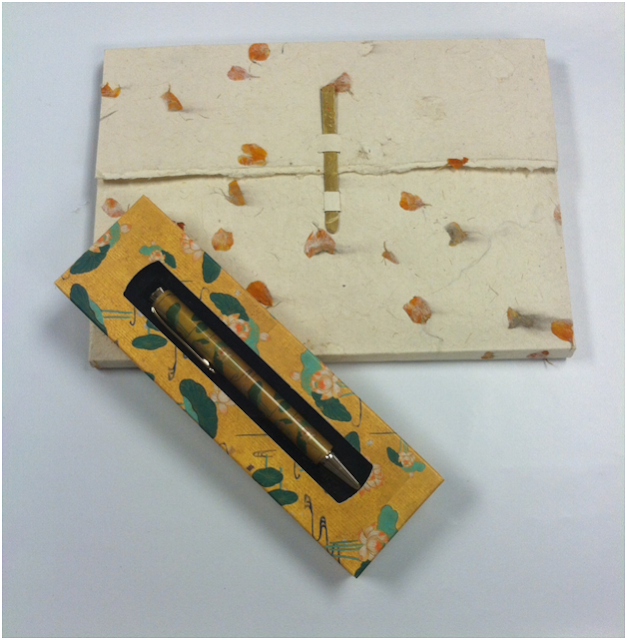 A great pen for an affordable gift or a treat for oneself. With a variety of colors and an enduring body, the Limonada is this summer's special from Monteverde. 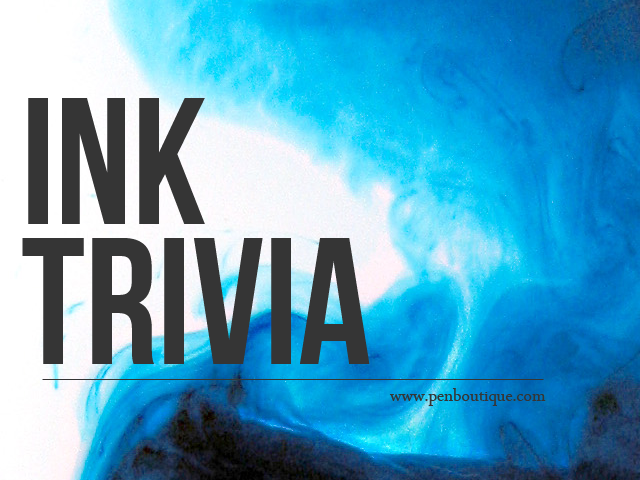 Question: How long will the average ballpoint pen refill last? Putting pen to paper can be a cathartic experience, especially for authors. Political journalist and psychotherapist Laurie Nadel, PhD suffered from the burden of anxiety. Nadel found a way to ease her mind in volatile surroundings. She focused by writing for herself. "I thought that if I could write everything down, I could stay safe." Even the most inexperienced writer can benefit by putting pen to paper. As long as your intention is to communicate with others or simply open up yourself, the form your musings take will be rewarding.So start that journal, write a letter, craft a poem, share an observation or start the next great American novel. The act of writing will take you on a journey that will enrich your life and quite possibly the lives of others. 1. 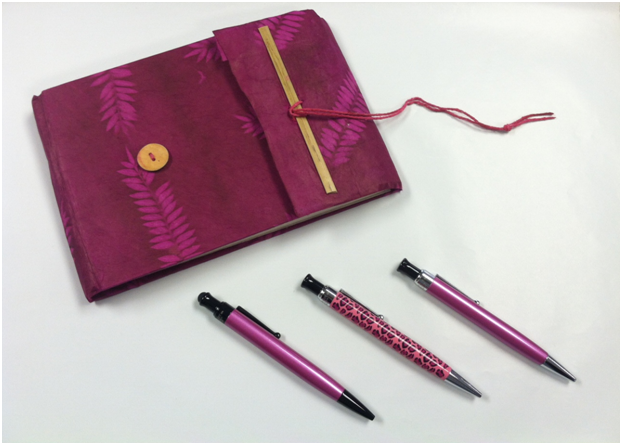 The Monk Paper Veg Dyed Fern Leaf Fuschia Travel Journal which pairs nicely with the Monteverde One-Touch Stylus Ballpoint Pink, One-Touch Skin Ballpoint Wild Pink or the One-Touch Pink Ballpoint. 2. 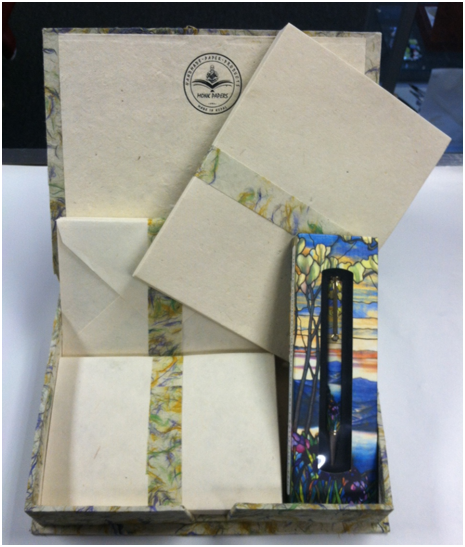 The Lokta Hemp Fiber Stationery Box Set goes great with the Metropolitan Museum of Art Ball Point Pen, fashioned from the Magnolias and Irises leaded-glass window by Louis Comfort Tiffany. This would make a perfect gift for a graduate who is going off to college or for a bride to write personalized thank you notes. 3. 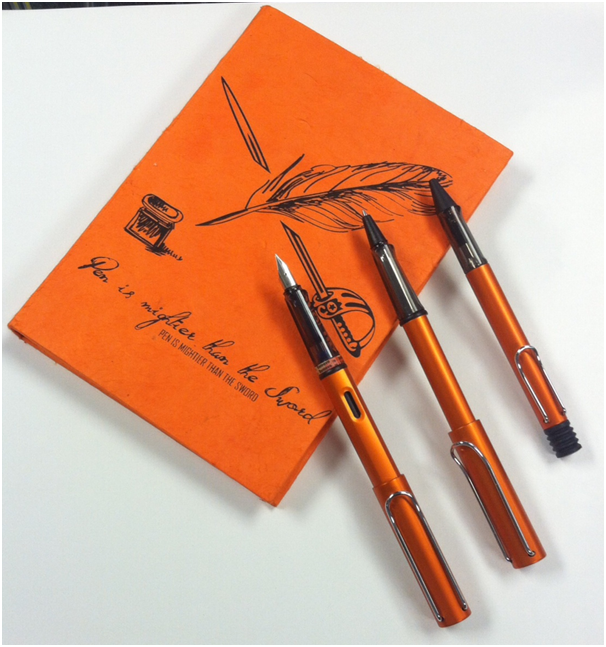 A great gift for anyone who keeps a journal is the Monk Paper Tangerine Quotation Journal which pairs up nicely with the Limited Edition Copper Orange Fountain Pen, Rollerball or Ballpoint pens. 4. 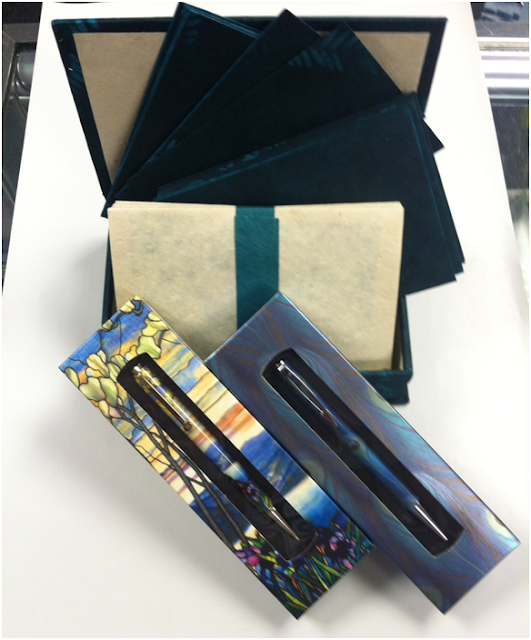 Feel free to pair the Monk Paper Veg Dyed Fern Leaf Teal Boxed Lokta Notelet Set with either the Metropolitan Museum of Art Van Gogh Irises Ballpoint or the Louis Comfort Tiffany Peacock Feather Favrile glass vase. These notelets can be used with silver, white or gold ink or as a cover for your own personal paper. 5. The Monk Paper Marigold Petal Stationery Set goes well with Metropolitan Museum of Art Lotus Sutra Ballpoint. A dainty set for a dainty lady celebrating a birthday, anniversary or graduation! 6. The bright and colorful Monk paper Batik Multicolor Patchwork Stationery Box Set is shown here with an array of Kaweco Sport ballpoints and pencils. These combinations should truly make writing fun for the young graduates! Writing with the pen is a pleasant surprise. The medium iridium steel nib is standard, yet is sufficient. When writing it is especially smooth on down strokes. Though a slightly firm steel nib, there is not as much feedback as one would expect. 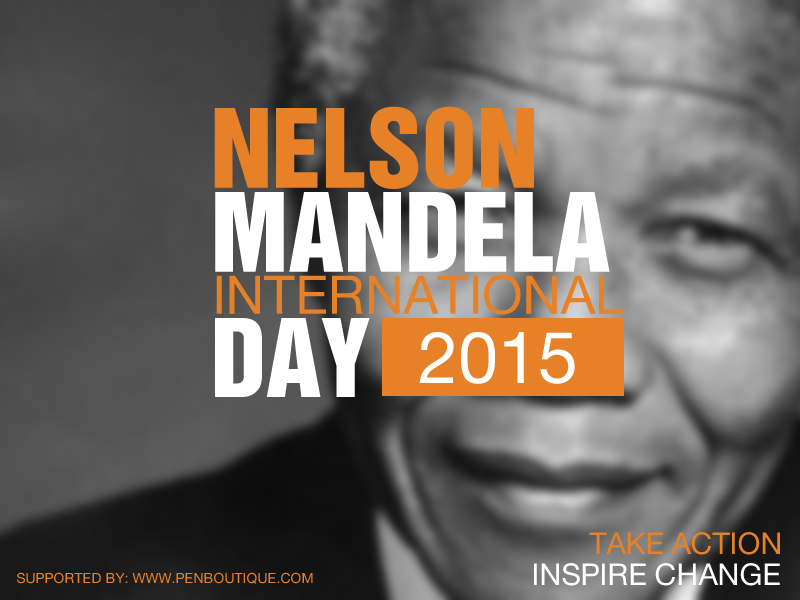 An added convenience is that a converter is also included and that the pen takes Standard International cartridges. One of the premiere museums in the world is New York City’s Metropolitan Museum of Art. Founded in 1870, the museum houses over 2 million works of art. Being the largest museum in the Western Hemisphere, it is one of the most visited destinations in a city known for its destinations. To highlight some of the museum’s treasured artists’ works, a collection of fine writing instruments was created based on the style of these artists. These pens afford a surprisingly great value for both the discriminating fine writing instrument collector and art connoisseur. 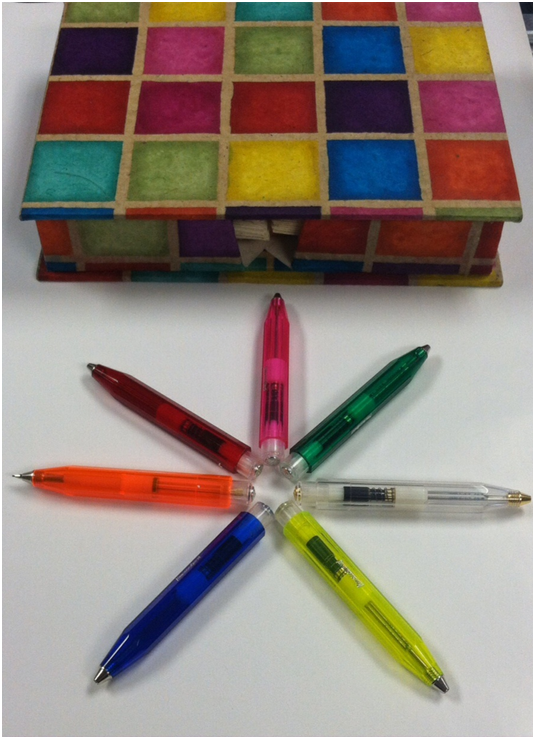 At such attractive prices you can purchase more than one of these keep sake pens! Louis Tiffany: The famed lamps and stain glass innovator generated many vases using his peacock feather designs. William Morris: This British designer produced captivating wallpaper spotlighting flowers, leaves and fruit. Vincent Van Gogh: The artist’s vivid treatment of colors and form is highlighted in this memorable depiction of floral brilliance. Claude Monet: Details from Monet’s beloved Vetheuil garden grace the contours of this beautiful pen. We may not want to admit it, but the start of the new school semester will come upon us fast. Lamy pens and Letts of London notebooks want you to be prepared. For a limited time Pen Boutique is offering a fountain pen/notebook combination that will have the most dedicated scholastic note taker set and ready to go. We have four different black and red combinations to choose from. Each set comes with a medium point fountain pen and a ruled notebook. A recent study by Princeton University concluded that you will retain information longer if you take the notes by hand. Taking notes by long-hand forces one to engage with the material a little more in order to pick out the most important and relevant information. By engaging with the content in this way your future studying should go more quickly. It was found that while taking laptop study notes many students were prone to distraction, multitasking on other sites and not being on task. All these elements led to decreased performance. For a short time we are offering, at a reduced price, this unique combination set that will help steer you on the best path to retain, study and learn.